A long distance baby shower is a great way to celebrate a new baby when the mom-to-be lives a little far and cannot make the trip due to travel expenses, bed rest and other circumstances. Using this kind of celebration, you can throw a fun party and include the new mommy in the celebration. This way, family and close friends can gather and share the love and excitement they have for the mom. Use a webcam at each location so everyone can see each other live. Arrange to have all the guests meet at your location. Coordinate with your guest of honor to be in front of her webcam when the party starts. Open gifts, play games, and interact with the mom to be. People can take turns talking with her as everyone relaxes and enjoys the day. If you are over ambitious, arrange to have the gifts sent a head of time so she can personally be the one opening the gifts during the party. Hold the baby shower without the mom to be. Video tape the party and use lots of film to capture everything for the enjoyment of the new mommy. Wrap gifts, share stories, have each guest record a special message with baby wishes. After the party you can send a care package with the gifts, photos and video to the mom-to-be for her to enjoy. Set up an online web party for your guests to attend. This is great if the guests are also spread out across the country or even across the world. Most services have a few games for your guests to play, have an online registry, and have a special chat room. Your guests will login to your party and be able to interact with the other party guests and chat with the new mom to be. Most web parties end about a month after the due date, giving your busy guests plenty of time to attend. NOTE: This is the only baby shower option that you do not need to worry about shipping gifts. The online party will provide a few games with the party package, but here are some games that could also work with long distance baby showers. Send it with the invitation for guests who are also out of town. Have each guest cut a string to the size they think would measure around the mom's belly. Send it with the package to the mom. The one with the string cut closest to the actual size wins. Have each guest guess the statistics of the new baby. It could be things like weight, length, hair color, time and date of birth. The person that guesses the most correctly wins. Ask the mom to be some questions to get an idea of her favorite things and thoughts on parenting. Compile a trivia for guests to answer to see how well they know her. The person with the most correct wins. The food and decorations for the celebration will be the same as if the mom-to-be were in attendance. If you would like to have a cake for her enjoyment, you can send a small diaper cake with the care package or arrange with the new dad to pick up a small cake for her to enjoy. I have heard here and there that the hostess was asking guests to bring a small amount to help cover shipping costs, like $2. The gifts, depending on how large they are can really add up making a huge shipping bill. Depending on how many guests you have and how close they are to the mom, you can choose if you want to go this route. Make sure you also compare prices on shipping with UPS and FedEx to make sure you get the best shipping price available. Ordering an item from a local store for her to pickup. Using a store like Walmart that ships from the website to her local Walmart. 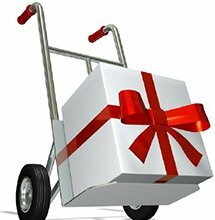 Purchasing a light shipping item like a gift card. Here is a poem I wrote for a long distance baby shower a little while back. They wanted the invitation to be worded from the baby. Hope it helps! For the day I will arrive. Only a mommy can provide. But there's still something you can do. and love from those who care. It's a long distance baby shower. For soon I will be here. You can add a personal message to it...explaining what you envision such as We thought it would be fun for everyone to "shower (name) with gifts" for her new baby, even though she lives far away from the family. If you would like to participate, you may send gifts or gift cards to (address). Good Luck with planning your long distance baby shower!